Reach college students on campus with online surveys & forms. When it comes to decision-making, group leaders are utilizing surveys to collect information from campus communities. Groupment's’ survey tools are a cost-effective way to collect information that can be used in meaningful ways. Let’s take a look at four ways students are using this handy tool. After an event, students often want to know how it went. In the Event module, group leaders can configure their event to send an automated survey to all the students who attended. 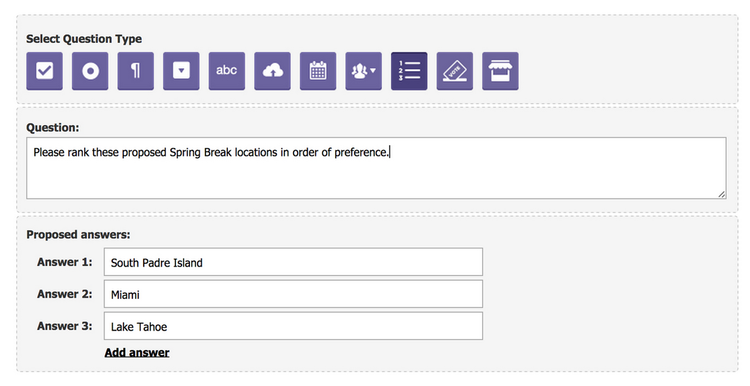 They create a custom survey in the Survey module and attach it to their event under the “feedback request” section. The feedback received helps them better plan future events. Every year, new officers are elected, but before that can happen, elections need to be organized. The Survey module allows groups to list leadership positions and a list of candidates for each position, each with an accompanying description and video link. The results of the election are visible by student leaders, or even a restricted subset of group leaders. Important rules can also be set for an election: students can vote only once, anonymous voting prevented or enforced, editing a vote allowed or prevented. It’s all up to them! They’re collecting mandatory information with distributed forms. When students create a survey, they can turn it into an actual form (similar to a PDF form layout). It’s a great way for group leaders to invite students to fill out information about themselves. This is especially useful when organizing a trip or at an event where information or documents needs to be collected from students. As a form, group leaders can also request that students upload files such as an ID or constitution. Gain greater insight into the opinions of your own group. Collect and analyze results through one central system. See displayed results and review submitted answers in the “manage” area and communicate with each person who submitted responses, all from within Groupment. Creating a Groupment survey is fun, simple and useful. Try it out! Survey students and club members to increase student engagement. Want to learn more about Groupment? Please contact us or set up a demo. We'd love to hear from you!